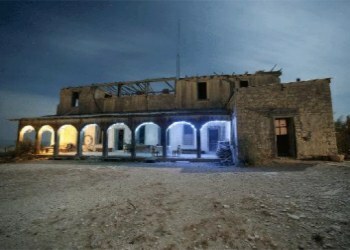 This unique two-room boutique hotel, is the center-piece of the Terlingua Ghost Town. Built in 1909 out of rock and adobe, the mansion was home to the owner of the Chisos Mining Co., Howard E. Perry. Situated on a limestone hill overlooking the Ghost Town, with commanding views of the Chisos Mountains, the mansion has 22 inch walls downstairs, and 14 1/2 inch walls upstairs. The addition on the South side of the mansion, which your room is located, was built in 1912, and has been restored to it's original condition on the interior. The outside of the building is very rustic with original paint & patina. Your room has a private entry, with stairs leading to your own private library, lining the walls of the landing outside your room. The library is filled with books about the Big Bend area, local natural history and culture, for your enjoyment. You will enjoy a fully functioning bathroom with flush toilet, sink and shower. The bathroom is located downstairs, in the hall of your entry. Your room is also outfitted with a small sink, for your tooth brushing pleasure! 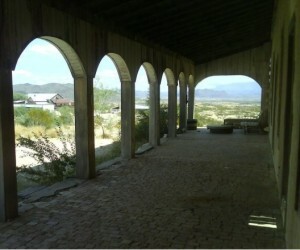 Within a short walk of the mansion, breakfast awaits you at the Ghost Town Cafe, espresso & wi-fi at Poco y Mas, and most notable the famous "Porch" at the Starlight Theatre & Terlingua Trading Co., where locals congregate to watch the sunset and trade tales, while enjoying a cold beverage, each evening. Room rates are $112 + tax, per night based upon two guests in one bed, a one time fee of $20 per extra guest. Get comfortable and relax, stay a week for $500 + tax. A two night minimum stay is required. Or if you prefer to reserve the Mansion as a two room suite, enjoying both upstairs and downstairs rooms with your friends and family the cost is $220 per night. Each room has a double bed and a twin bed, so you can sleep 6 comfortably. Again a two night minimum is required. Or, if you would like to enjoy the Mansion all to yourselves for a week, it's $1000 + tax. Full kitchen privileges, of course! Cash and checks only, please. 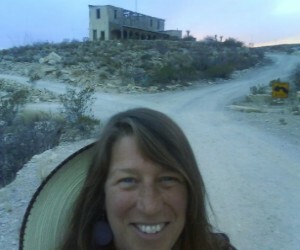 Come join me for a memorable and relaxing sojourn in beautiful Big Bend, Texas! Rio Grande river trips, lunch in Ojinaga, Mexico, hiking in the rugged Chisos Mountains, soaking beside the Rio, in Langford Hot Springs, and just plain old sightseeing in the amazing Big Bend National Park, will fill your days with wonder and warmth only the desert can provide. Terlingua is a mining district in southwestern Brewster County, Texas, United States. It is located near the Rio Grande and the Texas villages of Lajitas and Study Butte, Texas,as well as the Mexican village of Santa Elena. The discovery of cinnabar, from which the metal mercury is extracted, in the mid-1880s brought miners to the area, creating a city of 2,000 people. The only remnants of the mining days are a ghost town of the Howard Perry-owned Chisos Mining Company and several nearby capped and abandoned mines, most notably the California Hill, the Rainbow, the 248 and the Study Butte mines. The mineral terlinguaite was first found in the vicinity of California Hill. According to the historian Kenneth Baxter Ragsdale, "Facts concerning the discovery of cinnabar in the Terlingua area are so shrouded in legend and fabrication that it is impossible to cite the date and location of the first quicksilver recovery." The cinnabar was apparently known to Native Americans, who prized its brilliant red color for body pigment. Various Mexican and American prospectors reportedly found cinnabar at Terlingua in the 1880s, but the remoteness and hostile Indians deterred mining. A man named Jack Dawson reportedly produced the first mercury from Terlingua in 1888, but the district got off to a slow start. It was not until the mid-1890s that the Terlingua finds began to be publicized in newspapers and mining industry magazines. By 1900, there were four mining companies operating at Terlingua.